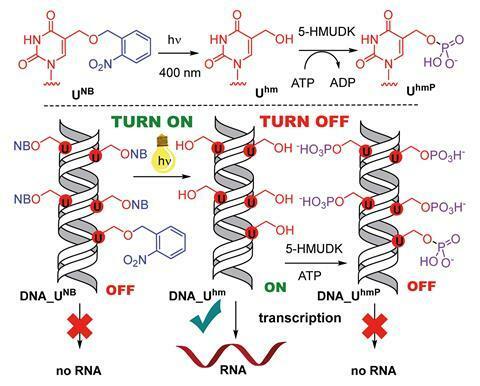 Fast-forward just over a year, and the group has now developed an artificial chemical switch capable of switching transcription on and off again, via reactions in the major groove of DNA – similar to the action of natural gene regulation. Importantly, the switch is bioorthogonal, meaning it can function alongside and not interfere with the natural biochemical actions of DNA. The group firstly produced bacterial DNA containing modified 5-hydroxymethyluracil (5-hmU) bases, as with their previous study, but this time they modified the 5-hmU bases with photoremovable nitrobenzyl protecting groups to prevent transcription. Irradiation by visible light at 400nm cleaved the protecting groups to switch transcription on, and enzymatic phosphorylation of the hydroxymethyl groups switched transcription back off, completing the off, on, off cycle. The team also investigated bacterial DNA modified with 5-hmC bases instead of 5-hmU bases, but although the system worked similarly for the first two steps, the 5-hmC-modified DNA failed to switch off again after enzymatic phosphorylation. This transcription control has currently only been explored in vitro, so the first challenge for the group will be to achieve their switch in vivo. They also plan to investigate non-photochemical bioorthogonal reactions in the major groove of DNA for switching gene expression and red-light-activatable photocaging groups, ‘which would allow us to switch transcription using non-toxic and deeper-penetrating red light for applications in tissues or even animals’. Is junk DNA all garbage?